Approximately 8 acres size ranging from 8 – 14 feet deep. 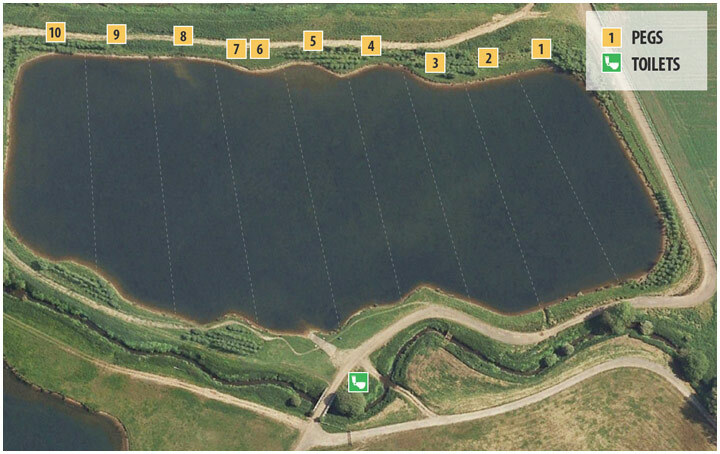 10 pegs all on the same bank, but peg 8 has 8b on the opposite bank. The reason for this was to try and keep the fish from hugging the far margin, and it is working. The pegs are about 30yards apart with a double peg in the middle if you want to be together. Like Glovers this is a bivvy water, but we do supply an unhooking mat, Landing net and Weigh Sling with each swim and we ask anglers not to bring their own to reduce the risk of disease. Like the other specimen lakes No Guests are allowed. All gates are open from 9am and locked from 5pm winter and 6pm summer. 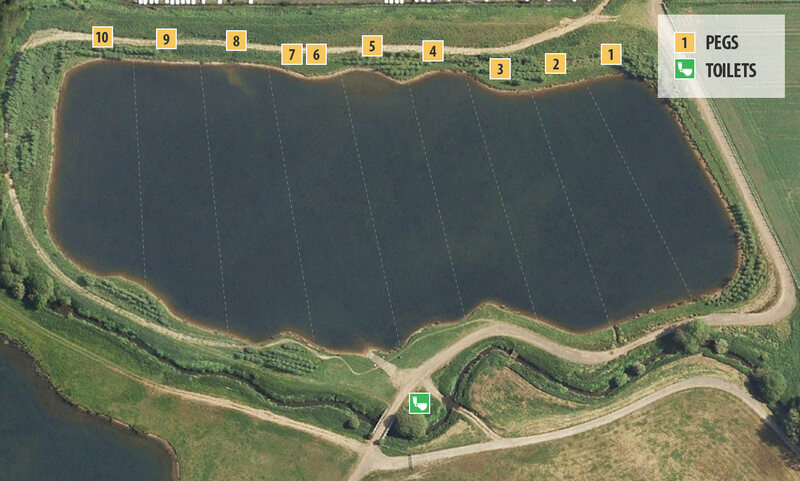 The Bridge Pool is fishing from one bank only, with nobody opposite apart from peg 8. You have plenty of water in front of you with ranges from 80 yards up to 135yards in front of the double swim. Bait boats are allowed on the Bridge Pool if needed, please have respect for other anglers when using a bait boat. Like The Quarry they are growing very well each year and it will not be long before it sees its first 40lb fish. Landed 9 fish with a 28 plus mirror the largest, with a few to mid and low twenty and the smallest 17lb. The Bridge Pool holds numerous fish over 30lb up to the current record of 39.08lb and a significant amount of mid to upper 20's. As with most waters fished from one bank the fish do tend to push over when we are full. You can go round opposite your peg like on Glovers to bait up which saves a lot of spodding disturbance. Do not ignore the end peg margins especially on fresh warm winds. Zigs and surface fishing in the summer is very good on this lake. Fishing over a well baited area produces good results. A variety of freezer baits work well with Mainline Cell-Hybrid and New Grange Bollies, Sticky Baits Krill and Manilla all working well. Dynamite Baits Monster Tiger Nut is a classic along with the new Complex-T baits and liquids..
Zigs and floater fishing are very good for up in the layers. Chods, multi rigs, combi rigs, Ronnie rigs, and PVA bag rigs all catch fish. As well as our on-site tackle shop we also have our online tackle shop to make ordering and browsing your next bit of kit as simple and convienient as possible.